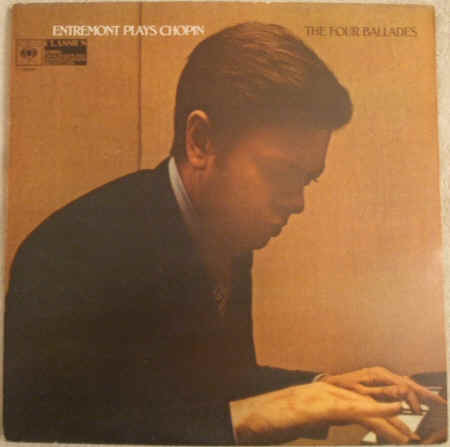 33rpm LP Record of CBS 61210 ENTREMONT PLAYS CHOPIN The Four Ballades, featuring Philippe Entremont on piano. It was issued on the Stereo CBS Classics Red label. UK pressing. The record itself is graded excellent, with just the odd light surface mark when viewed under normal house lighting. Play-tested on a ION USB turntable. Superb sound quality, with NO jumps, ticks, pops or crackle. Just about faultless. Minimal to no spindle wear. Labels very clean. No visible spider marks. The outer sleeve is graded very good, with just some light rubbing to edges, bumping to corners, light ring wear to the back cover, which is also lightly soiled. The original inner sleeve has no more than very minor wear.